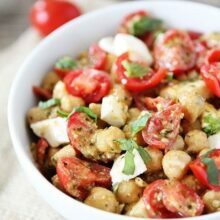 Chickpea, Pesto, Tomato, and Mozzarella Salad-this simple salad is fresh, flavorful and can be made in less than 10 minutes! In less than a month, unless I am really overdue, I will be having a baby! YAY…and YIKES! I am excited, but I am starting to get nervous. I know this is my second time around, I should be a pro, but you really can’t plan for your labor and delivery…and since I am a planner, this makes me nervous! I wish I knew exactly what day and time this baby was going to make an appearance. That would make me feel much better. I have my due date circled on the calendar, but we all know that date doesn’t mean anything. Luckily, I am extremely busy and don’t have too much time to worry. My to do list is a mile long, but I always make time for good food. I am not one of those people who forget to eat when they are busy, especially when I am pregnant. Food always comes first! This week, I made a Chickpea, Pesto, Tomato, and Mozzarella Salad for lunch and it hit the spot. When I am busy and short on time, I like to make salads for lunch. Tossing a salad together is easy and healthy. I also love getting creative with my salads. I never get bored with my lunch salads because I am always combining new ingredients. If you are busy and don’t think you have time for a healthy meal, think again. 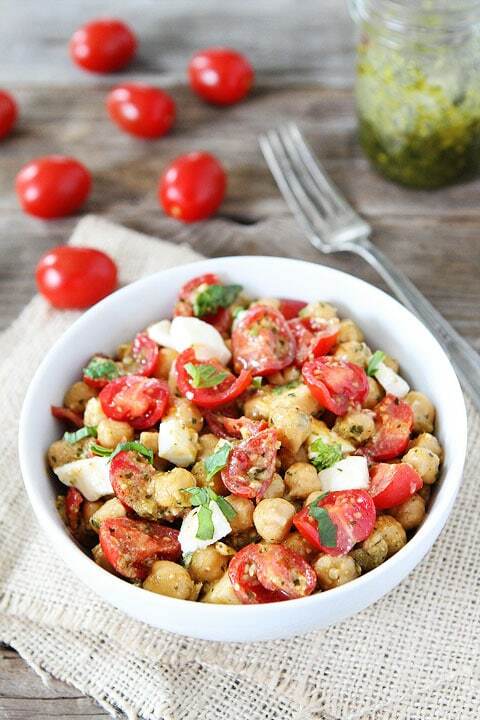 This Chickpea, Pesto, Tomato, and Mozzarella Salad is easy peasy! It is great for lunch, dinner, or summer potlucks! This quick and easy salad only has 4 ingredients and takes less than 10 minutes to make! 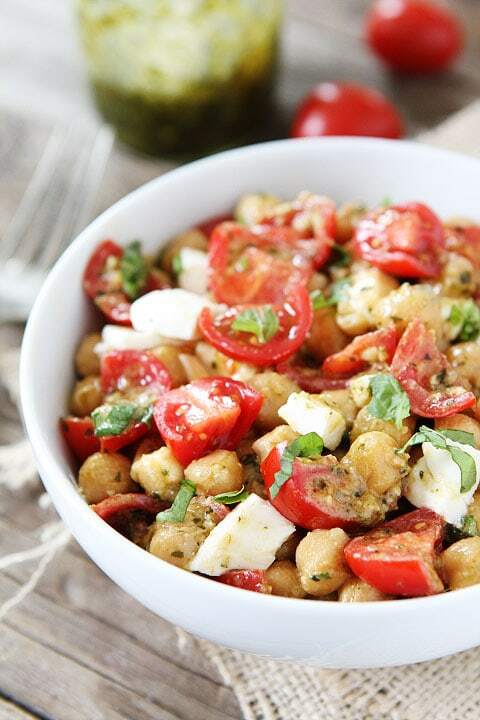 In a medium bowl, combine chickpeas, pesto, tomatoes, and mozzarella cheese. Gently stir. Season with salt and black pepper, to taste. Garnish with fresh basil, if desired. Serve. So… When I was pregnant I was worried that my son’s birth would conflict with my sister’s wedding. A friend suggested that I talk to the baby in utero and tell him when to come out. I did ask him to come a few days early so that we could all go to the wedding, and lo and behold he did exactly that. 😉 I know it sounds silly but you can give it a try. And congratulations!! I’m a man and I get nervous when my wife put’s chickpeas and extra’s in my salad. It’s king of the same reason why I can’t eat potluck dinners. Saying all of that this looks really good and my wife can make it in less than 10 minutes? I’m in! This looks delicious! I feel like summer makes 10 minute meals so much easier with all of the fresh, in season ingredients available. I can’t wait to make my first batch of pesto! My mom would relate with that last month of the pregnancy – we just had our baby . . . on the Fourth! I love your little Caleb. He is ADORABLE! I crave this type of food every day!! Looks amazing! My second came nine days early. It was quite a surprise as the first was 11 days late. You just never know. Salad looks yummy. I might have to make it tonight. This looks like such a simple and flavorful salad to throw together! I will be adding it to my lunch rotation next week! This looks so healthy and good! 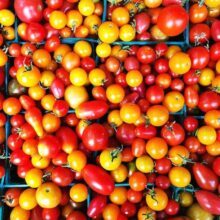 Love those bright red tomatoes! So exciting, Maria! I can’t wait to see your newest addition. This salad looks so perfect for summer! It doesn’t matter how many times you’ve been through it, it’s always nerve racking! How exciting that it’s only weeks away! Our entire family loves chick peas so I am really excited for this easy to make salad!!! Perfect for summer eating!! And congrats on the final stretch…you got this!!! You know why I love this? My husband’s away this weekend which means its a “cooking-free” weekend for me. This requires absolutely no cooking. Love it! You had me at pesto! But I love every other ingredient too. Such a nice summery side. I love to put these salad recipes you come up with on a bed of spinach or arugula. 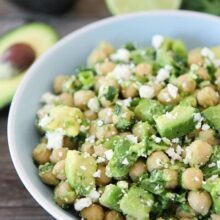 My lunch today was your chickpea, avocado salad on arugula…delish! This will be the next one I try…makes a great, healthy, delicious lunch! I love your creative salads!!! Ah, I’m mildly obsessed with chickpeas haha. You seriously always post the BEST simple, gorgeous salads! Maria ~ How long will this stay good? A couple days or is it best day it is made? It is best the day it is made. I did eat leftovers the second day and it was fine, but better the first day. I hope that helps! It is best the day it is made. Although, I did eat leftovers the next day and it was fine, but if I was serving it I would make and serve it the same day! what a great summer salad!! So excited for the newest little pea! Can’t get enough big salads for summer. This one is going on the menu. Less than a month!! How exciting! This salad looks delicious. I can’t wait to try it. I’m such a sucker for salads like this. Chickpeas are my favorite by far. Congrats on being full term! Seems like that pregnancy went by fast! Yay! I can’t wait to see those pictures especially Caleb holding baby! 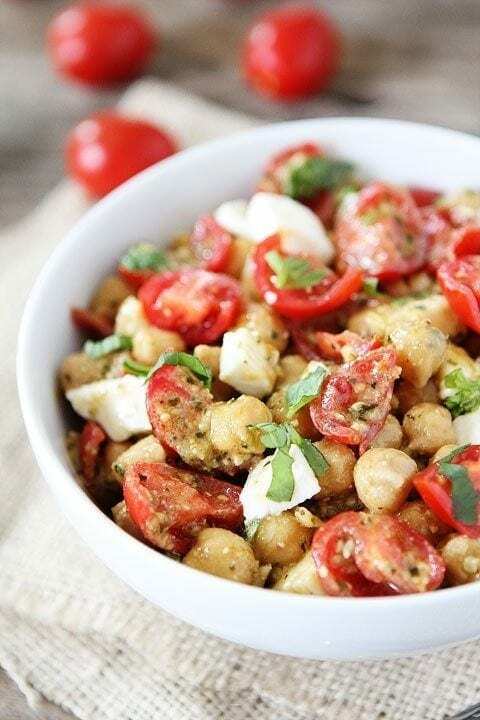 I love chickpeas I am going to try this one looks delicious! My family would go nuts for this salad! This looks delicious. My Mum would love it. This looks like such a fresh and fabulous summer salad! I love the addition of the pesto! Love this salad. Mozzarella is a favorite! Only 10 minutes to make? Sounds like a winner! Yep, I’m in love with this one. All my favorite foods in one bowl. 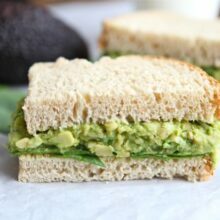 Pinned a few days ago and haven’t stopped wanting it for lunch! So glad you enjoyed the salad! Could you include the nutritional information for this recipe? It sounds delicious. And it would be helpful to have this information on all your recipes. Thanks!! I made this the other day for lunch for the hubs and I. It was great! The only thing I did was make it the night before so I wouldn’t have to take time in the morning. The flavors set very well AND my husband asked me if I could make it again. We had it over a bed of fresh spinach. Thanks for a great lunch! I made this for dinner tonight. It was delicious even with winter grape tomatoes and jarred pesto. I used about 4 ounces of the tiny mozzarella balls and added about two tablespoons Italian parsley torn into small pieces since I had no basil. I will be making it regularly, too. After procrastinating for a lonnng time, I finally made this. HOLY YUM! Super quick, and so yummy! 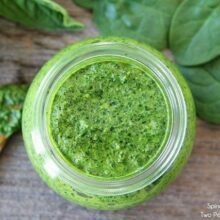 when you say pesto, are you using a powder pesto seasoning or a liquid Pesto? Pingback: 14 Summery Salads That Prove Eating Healthy Can Be Delicious - Do You Still Hate Me? Is there a way to print your recipes from an iPhone? Husband is not a fan of this salad due to the garbanzo beans, but that’s ok cause I was really making it for myself anyway. And me? Oh I LOOOOOVE this salad! I wasn’t sad that I didn’t have to share. It made for a great lunch the next couple of days. It really needs the fresh basil. Don’t decide not to cause it sounds like a garnish. Fresh basil has tons of flavor. Yes, I know it’s already in the basil pesto, but the added extra fresh basil is worth it! 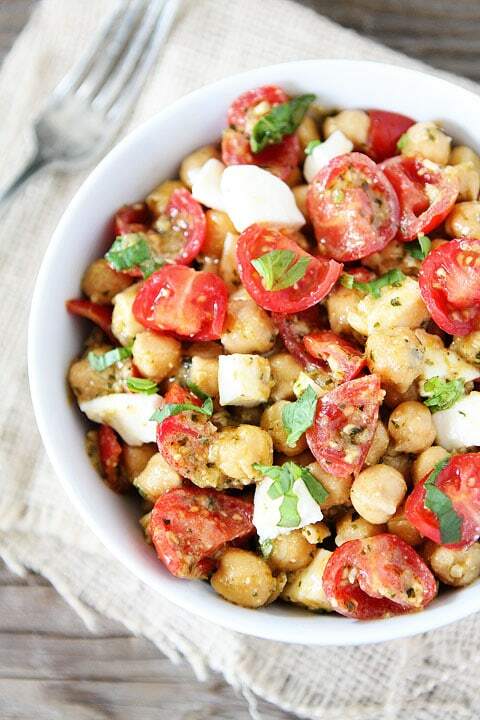 I would probably cut down to 1/2 can of garbanzo beans though, because I feel it takes over the entire salad. This is delish, perfect for a spring or summer potluck. Really lovely recipe and so easy to make. I did put it in to a seeded wrap which really made it a bit more filling for me. Would recommend. Great idea! Glad you liked the recipe!